Black calf leather and leather crisscross slides from Baldinini featuring a round toe, a branded insole and a flat heel. Free Shipping on Full-Priced Items! Free. Flat shipping fee on orders above 150 USD. 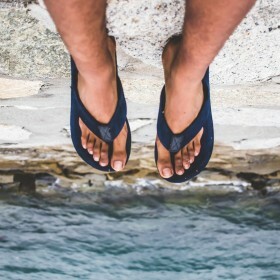 For a comfortable option to wear to the mall,on an evening or of course to the beach, flip flops are an obvious choice. With a huge variety of colors and materials, Fashiola has an extensive collection for you to search through using the filters - why not start by looking through the leather slippers? The collection has a great range of traditional styles or the latest fashion in sliders and if you are searching for the latest trends from your favorite brands you can explore the category too!